LINCOLN, Neb. — The Nebraska Game and Parks Commission received the Land Stewardship Award from the National Wild Turkey Federation (NWTF) on Feb. 16 during the 41st annual NWTF Convention and Sport Show in Nashville, Tenn. The award was presented to the Commission for promoting responsible forest management, wood procurement and manufacturing practices for the benefit of the nation’s forests, wildlife and people. The Commission and the NWTF have a long history of partnering to enhance wildlife habitats across Nebraska. The Commission manages land on 290 wildlife management areas, which comprise more than 185,426 acres. Projects have included treatment of invasive species, controlled burns, improved hunter access, grassland and oak woodland restoration, as well as habitat maintenance. Through its State Wildlife Action Plan, the Commission has identified 35 biologically unique landscapes. Within those landscapes, the agency displays the best management practices available to reverse downward trends in habitat quality. This allows private landowners and agencies alike to watch active habitat management in real time. Nebraska boasts an abundant population of wild turkeys across the state, including birds with characteristics of three subspecies – the eastern, the Merriam’s, and Rio Grande. 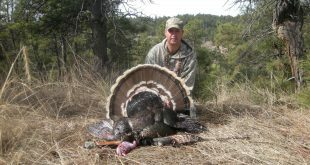 Hunters in Nebraska can obtain three over-the-counter spring permits and enjoy high success and satisfaction rates harvesting turkeys on public lands. The 2017 spring turkey season for archers opens March 25. Shotgun season opens April 15 (April 8 for youth). Purchase permits at OutdoorNebraska.org. For more information on turkey hunting in Nebraska, visit Outdoornebraska.gov/wildturkey. Previous 2017 Omaha Sport Show!